One of the trickiest parts of practice is effectively breaking down the difficulties into digestible bits. Lately, I’ve been having my students do what I call “ghosty bow”, where they move the bow just above the string while singing the music so as to practice bow changes without distractions from a funny note or a weird rhythm. Just today, I read an article from Laurence Lesser that suggests the same thing minus the funny name. link everyday, natural activities to motions on the cello. I especially appreciated the example of shifting from a high position to a low position. Think about the motion of your hand when it goes from resting position to pointing at your nose and relate that hand/finger/forearm motion to your downshift. 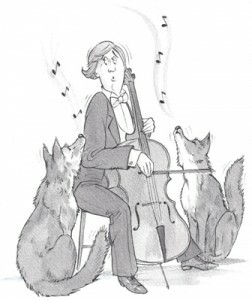 “The currently accepted explanation of the wolf note is that it is caused by the massive vibrations of the cello body associated with the cello’s simplest and most fundamental mode of vibration or resonance. 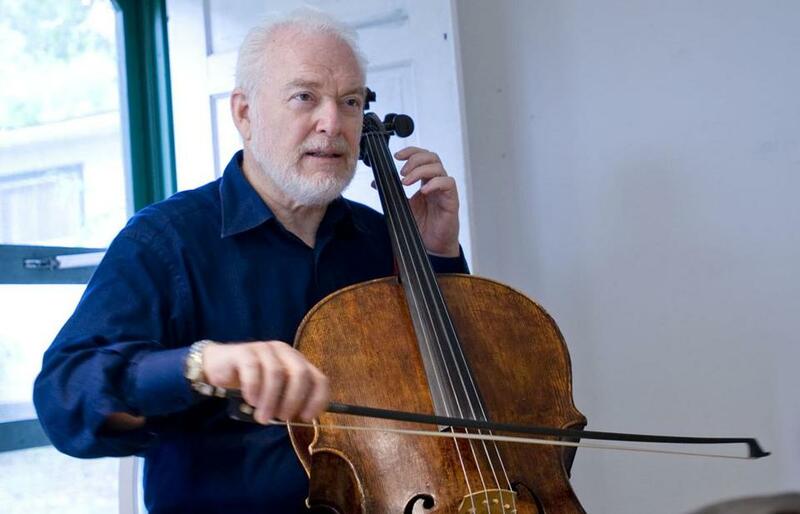 This is the harrowing tale of Paul Katz, a professional cellist that was forced to check his priceless Guarneri cello after buying it a seat on the airplane. This is the stuff of nightmares! 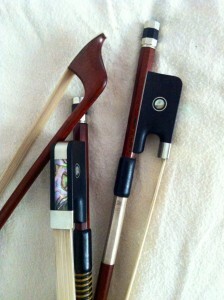 When it comes to bows, I’ve never been that interested in makers, maintenance, or rosin. 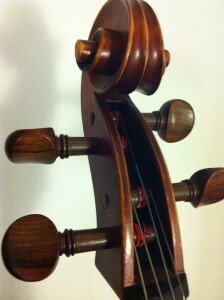 When my cello colleagues at Oberlin were trying bows between $900 and $3000, I thought they were insane. Then, about a month ago, when I accompanied my violinist friend to David Stone’s shop, my eyes opened for the first time to the huge difference a bow can make in the sounds you can draw from your cello. I played with a handful of bows he had in stock and took one home to try for the week. At quartet rehearsal, my violist immediately noticed that my sound had a clarity and quickness that my old bow never had. Practicing became a lot more rewarding because I didn’t have to work so hard to get my lower strings to sound. The response was so much quicker with this new bow that it became clear that I needed to graduate. I’m still in the trial process with a couple of different bows – making a brash decision on an investment like this isn’t a great choice – but I’m excited to move on from my old crooked bow. Once I find a bow, however, I will take much better care of it than I did my current bow. They ought to get rehaired at least twice a year and protected from serious climate changes. I’ve also started playing with much looser bow hair rather than cranking it to the point that the hair is rigid and straight. This gives me a much richer sound and preserves the bow’s structural integrity. I’m writing all of this so that a) you don’t make the same mistakes I made with my old bow and b) I’m accountable to all of you for taking my bow care seriously. To read more about bows (from people who know a ton more than I do) read this article about Selecting a Bow or peruse the articles on David Stone’s website. While I think all the cellists who have made names for themselves are wildly talented and admirable, there’s one cellist who keeps winning. 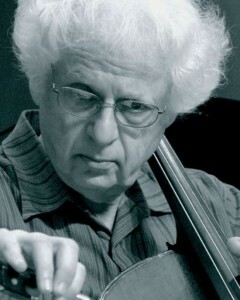 Steven Isserlis plays every piece of music the way I want them to be played. He’s sensitive, particular about where he uses vibrato, dramatic with dynamics, a stickler about tone, and he takes his time in just the right places. The Bach Cello Suites are perfect in his hands. The Martinu Sonata sounds effortless. People always say that Rostropovich’s Dvorak’s Cello Concerto is the quintessential rendition, but after watching this video of Steven Isserlis, I think I have a new favorite. I hope you enjoy it as much as I do. 1. “… the majority of folks practice rather mindlessly, either engaging in mere repetition (“practice this passage 10 times” or “practice this piece for 30 minutes”) or practicing on autopilot (that’s when we play through the piece until we hear something we don’t like, stop, repeat the passage again until it sounds better, and resume playing through the piece until we hear the next thing we aren’t satisfied with, at which point we begin this whole process over again).” It’s a “waste of time”, a confidence killer (since you don’t actually get consistently better when you practice this way), it’s a total chore and it doesn’t prepare you to perform. 2. Deliberate practice, on the other hand, is intentional, goal-oriented and experimental playing. Be clear about what you want to achieve in your practice session and, if you notice yourself drifting into mindless playing, stop, make a goal, and get creative about achieving that goal. What I like to tell my students is to make goals before they sit down to practice. This way, they have a mission to achieve rather than just an hour to fill with cello noise. 3. Practice “smarter, not harder”. If it feels like you’re banging your head against a wall when trying to learn a difficult passage, try something new. When one of my students was having a hard time getting beautiful tone while playing the Prelude to Bach’s 1st Suite, we experimented with what she should concentrate on before she started the piece. Get clever about getting what you want from your practice sessions. 4. Basically, “it doesn’t matter if we are talking about perfecting technique, or experimenting with different musical ideas. Any model which encourages smarter, more systematic, active thought, and clearly articulated goals will help cut down on wasted, ineffective practice time.” You’re not practicing (I hope!) to say you practiced; you’re practicing to sound and feel better on the cello. If you keep that intention, you’re well on your way to effective, feel-good practicing. I just found this video of an old man who has been in a nursing home for ten years and is depressed and introverted and responds very little to other humans. By having him listen to music from his past, doctors have been able to chat with him and see a person who seemed so distant come alive again. It’s pretty amazing how deeply enmeshed music is in our psyche and it makes me grateful to have it in my life everyday. I hope this perks up your day as much as it’s perked up mine! I’ve had the same cello since January of 2000 and I lovingly named it “Baby”. It traveled the US on my various music adventures. We’ve lived in Seattle, Chicago, Ohio, Vermont and Massachusetts. In the process, Baby endured a lot of abuse from traveling and colder climes. While living in Chicago in the winter of 2010, I had Baby on my back in its soft gig case when I slipped on the ice, leaving a big crack up the front and a crack on the neck. I’d already wanted to move away from Chicago but this really sealed the deal. When I got Baby checked out, I was told the cracks were just cosmetic blemishes and that they weren’t a big deal. Fast forward to Monday, January 16th, 2012. It’s cold (for Seattle) and I left Baby in the car after rehearsal and, when I picked her back up, I heard a LOT of noise coming from the case. When I got inside, I unveiled the damage: Baby’s neck finally snapped. When I took her into Carrabba’s the next day, I got the rough news that it would cost between $5000 and $7500 to replace a neck and my cello wouldn’t sound very good afterwards anyway. Now comes the lovely turn of events. Carrabba just so happened to have a cello in my price range that sounded about a thousand times better than Baby. While I don’t recommend investing in an instrument so hastily, I needed a cello and this was a beauty. I got it. It’s beautiful and vocal and deep and I’m smitten. Upon investigation, I found out that my new cello was made in Germany, so I named it Hans after my most merciless cello teacher, Hans Jorgen Jensen. I’m hoping that a daily reminder of Hans will keep me practicing those arpeggios. What lesson can we learn from this dramatic episode? 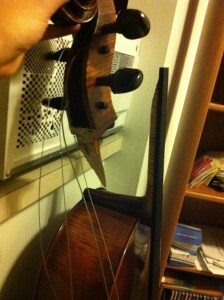 Be good to your cello. Go the extra mile to make sure it doesn’t get too cold or too hot and don’t assume it will be 100% okay in a soft case. 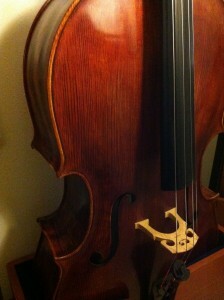 Treat your cello like the precious piece of art that it is and it will repay you by staying in one piece.